"With its cornerstone laid in place on September 8, 1889, St. Joseph's Church was dedicated on November 9, 1890. This center altar, one of three, was resplendent in white and gold and was created under the watchful eye of Father J. E. Millerick, according to written reports. Its beauty and 'striking features of its beautiful interior' remained unchanged until a fire on March 24, 1977 destroyed the church building. Crews from 16 communities battled the wind-swept fire which began during the mid-morning hours. Newspaper accounts of the day reported that the fire probably began behind the altar. A new church was dedicated on June 27, 1980 at the same location at the corners of Albion, Tuttle and Murray Streets." -- Text from calendar by Jayne M. D'Onofrio. 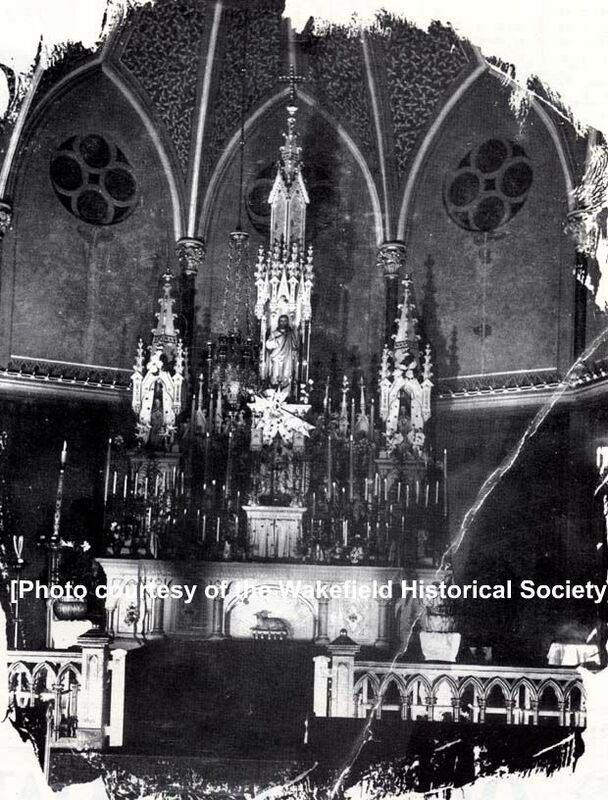 “The altar at St. Joseph's Church, circa early 1900s,” NOBLE Digital Heritage, accessed April 20, 2019, https://digitalheritage.noblenet.org/noble/items/show/7090.